Phoenix, AZ, April 04, 2019 --(PR.com)-- Zenventory, a fast-growing inventory and order management platform for small to mid-sized businesses, announced its integration with Shopify today as an addition to their growing list of native integrations. Merchants can upgrade their inventory and order management processes with new time-saving features by linking their store to their Zenventory account. The added features include more sophisticated tracking of product information, such as serial numbers, lot numbers, expiration dates, and detailed location-mapping of inventory. Workflows designed for barcode scanning (rather than manual data entry) help to eliminate errors and ensure quality control. Zenventory also offers improved handling of bundled and assembled products, with bills of material and even work order management capabilities. And, with a mobile app, users can do their work from anywhere in the warehouse, with no proximity required to a fixed workstation. Let's not forget connectivity. As one of the most powerful and easy-to-use shopping carts for growing brands, Shopify is often the primary sales channel for e-tailers. But when these merchants choose to diversify and offer products on additional marketplaces like Amazon and eBay in the quest to find new customers, the challenge becomes keeping all these different platforms updated efficiently. 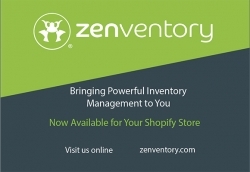 With Zenventory serving as the master record, synchronized inventory levels are pushed out to all connected channels like Shopify, Amazon, and eBay. It also works in reverse, automatically increasing available inventory everywhere when stock is replenished. Zenventory’s solution solves the common problem of merchants overselling on marketplaces due to the lag time between manual updates. It also ensures no sales opportunities are missed due to a forgotten stock level update. Zenventory also promotes a more team based approach to daily tasks. "The learning curve and the ease of accessibility will often make or break the rollout of an inventory system, especially when you're dealing with larger teams like you find in a warehouse environment," says Ben Peryea, Product Manager at Zenventory. "Our interface and workflows tend to be intuitive, based on the way warehouses operate. And since we don't charge extra for each user account, the whole team can get on board and benefit without impacting cost." Shopify is only the latest of many eCommerce apps supported by Zenventory with more partnerships set to be unveiled later this summer. The Phoenix-based team is always on the lookout for new partnerships in need of a superior inventory management system. "Shopify is a massive player in e-commerce with over 600,000 merchants using the platform today. and we know that number is growing," said Jennifer Wing, Director of Marketing for Zenventory. "We heard Shopify users say they need better ways to manage inventory and orders, so that’s what we delivered." Zenventory is a leading cloud-based inventory and order management system. Built from the ground up to meet the demands of multichannel sales and fulfillment environments, Zenventory users enjoy seamless integrations to top e-commerce platforms, shipping engines, and accounting systems. With customizable workflows and a modern, easy-to-use interface, the system provides small to mid-sized businesses, the tools they need to accelerate growth and promote efficiency at scale. Zenventory is a product of Ubiquia, Inc., a seasoned team of app developers headquartered in the thriving hub of the "Silicon Desert" in Phoenix, Arizona. To learn more, visit zenventory.com or call (480) 530-2100.